[00:06:59] <K`zan_emc> Looks promising, board came up, steppers are locked and I can hear the chopper :-)! [00:07:05] <K`zan_emc> anonimasu: Checking now. [00:07:38] <K`zan_emc> Very cool, what is it? [00:07:53] <K`zan_emc> Being able to easily machine curves and circles is going to be wonderful! [00:08:40] <K`zan_emc> Going to run the config thing again and see if I got a clue about any of it :). [00:09:15] <K`zan_emc> Yep, I'm sure impressed :)! [00:09:49] <tomp> the cbore base looks thin, ist it? [00:11:26] <anonimasu> it has _some_ bugs, but price/performace vs solidworks it wins. [00:13:34] <K`zan_emc> Cool, all axis work! [00:13:41] <tomp> good goin ! [00:14:01] <K`zan_emc> Probably will need to adjust stuff, but, they move :). [00:14:29] <K`zan_emc> running 1/2 step (2), not sure if I want or need 1/4 step or not.... Time will tell. [00:15:06] <K`zan_emc> Daisy has a bad char :-(. [00:15:36] <K`zan_emc> Loaded Daisy out of the examples folder and it puked. [00:15:45] <K`zan_emc> Lemme load it again. [00:15:47] <tomp> line & msg ? [00:16:19] <tomp> maybe it has axis that you dont have ? [00:16:23] <K`zan_emc> "Near line 24 of .../daisy.ngc: Bad character 'a' used. [00:16:31] <tomp> got an a axis? [00:16:42] <K`zan_emc> Yes, have one, not hooked up or configured. [00:16:45] <K`zan_emc> Understand now :). [00:17:19] <anonimasu> no wait, the sensors I have might be hall. [00:17:24] <anonimasu> I cant remember..
[00:17:49] <anonimasu> no wait.. more like 10..
[00:20:52] <anonimasu> did you kill them? [00:23:45] <K`zan_emc> Running snowflake - Neat! [00:27:49] <K`zan_emc> * K`zan_emc VERY please and VERY VERY apreciative of the whole EMC crowd! [00:28:23] <K`zan_emc> tomp: Heh, could be called that. Max temp on the steppers was 117F on Y. Not bad. [00:28:42] <K`zan_emc> So, now I get to start screwing together the Pipe Dream :). [00:29:09] <tomp> very cool, watcha plan on doing with the machine? [00:32:25] <K`zan_emc> fenn: search is sucky and I get tired of having to page through 10 pages of advertising related finds to get to anything useful (if). [00:33:27] <K`zan_emc> It just gets more useless by the day ;-/. [00:36:46] <K`zan_emc> Whatever, it sure doesn't make my life easier. [00:37:16] <K`zan_emc> I do my best too :-)! [00:37:51] <K`zan_emc> Lawyers first, they help empower the spammers. [00:38:06] <K`zan_emc> There will be PLENTY for everyone :-) when the time comes. [00:40:09] <K`zan_emc> Lack of morality too, anything, abuse anyone for a buck. [00:42:12] <fenn> isnt that a 34V supply though? [00:42:12] <K`zan_emc> :-) :-) :-), cool, got two in the drawer here I have been saving forver, was going to order a 24V one but if those work - 2 is better than 1 :)! [00:42:27] <K`zan_emc> 24V for the fan. [00:43:14] <K`zan_emc> Just checked it, there is a 24V regulator on the board. [00:43:53] <K`zan_emc> Gonna have to dig for the fans, they are a long way down LOL! [00:44:00] <K`zan_emc> 145F at end ! [00:44:17] <K`zan_emc> Neato, time to turn it off and go get some FOOD! [05:15:35] <tomp> nice shiny soldering, and no goopy white grease thumbprints :) looks good ! [05:43:46] <K`zan> tomp: Well, close anyway. Thanks :-). [07:55:15] <SkinnYPupp> Thats a sign I should get in bed..
[14:22:08] <jepler> how do you like it so far? [14:24:18] <stustev> The EMC2 reliable part? [14:29:14] <cradek> stustev: how is cinci-stuart? [14:31:39] <cradek> but the video looked great. I like the tilted drilling motion. [14:32:35] <stustev> I want to show the program at the same time as the motion so people can see how simple the program is. [14:32:54] <cradek> it looks like the B axis is arranged so the built-in pivot length is short, like I did on my little machine. I hadn't noticed that before. [14:33:40] <stustev> the pivot length is 5.25 inches. The lever to tilt A and B is very long. [14:34:39] <stustev> jepler: I looked for a reference I could modify to allow the cone to tilt in the 5th axis. [14:36:28] <cradek> are the existing ones no good? [14:39:43] <stustev> The existing ones are SCR driven. They work. The tuning is difficult. I am just modifying the existing accel and decel the SCR amps have. The SCR amps have pots on them. There are eleven pots on one amp and twelve pots on four amps. [14:40:35] <stustev> I haven't touched any pots yet. Tuning with EMC is what is modifying the existing accel and decel. [14:40:48] <stustev> That is why I want a dumb amp. [14:41:14] <cradek> was someone on the list finding the amp manuals for you? [14:42:20] <stustev> Yes, but I already had those. It tells how to adjust the pots - using equipment not available. [14:42:58] <cradek> I bet Jon E could make a larger amp for you. But he may not be able to sell enough to make it worth the development. [14:44:27] <cradek> haha, probably not. [14:45:51] <cradek> stustev: are you coming to cnc workshop in june? [14:46:49] <stustev> alex_joni: 600V DC? [14:47:34] <stustev> doesn't 480 VAC rectify to 600 VDC? [14:48:04] <stustev> I am looking for to the workshop also. It will be fun. [14:48:24] <stustev> what is the mazak objective this year? [14:49:35] <stustev> is Roland using it? [14:50:29] <stustev> has there been any more discussion? [14:50:58] <cradek> I think roland and ray will work out the program. it is a fairly simple part he wants to make. [14:52:36] <stustev> I haven't met him yet. It will be good to meet him. [14:54:10] <stustev> a network of machines? controlled by one control? [14:57:01] <stustev> would he need any help? [15:00:26] <cradek> what sfm and coolant? [15:02:00] <stustev> tomp: probably - those sound like what I am wanting. The SCR amps are 33 amp rating at approx 100 VDC. For how long can the 423's put out 35 amps. The y axis pulls 20 amps just to move. [15:02:47] <stustev> anonimasu: what cutting tool are you using? [15:03:41] <stustev> the four flute doesn't have a deep enough flute to let the chips get out. [15:04:08] <tomp> stustev: size of 2 packs of cigarretes, needs a simple dc supply ( unreg ) flip a dip swx to get current mode, and give it the analog command from emc ( untested ). [15:05:42] <stustev> do you have any two flute cutter? [15:06:07] <stustev> what machine are you using? [15:07:00] <stustev> tomp: SOME stiction? the y axis ram weighs 30,000 lbs. It has to move all that mass for every cut. [15:09:15] <stustev> anonimasu: with a solid machine and fixture you should be able to cut 10 mm width and depth with ease. [15:11:08] <anonimasu> brb, I'm going to go look for some 2 flute cutters..
[15:13:33] <stustev> it will surely cut a full width slot. At whatever depth the length of the flutes are. You probably shouldn't try for more depth than 1/2 the flute length. [15:14:47] <anonimasu> it might be the 4 flute cutter. [15:15:25] <stustev> In iron and steel the four flute cutter is the correct one. [15:26:40] <anonimasu> stustev: still there? [15:43:58] <jmkasunich> anonimasu: you are cutting a slot, not just cutting on one side? [15:50:34] <anonimasu> and I need ot plunge somehow..
[15:52:07] <anonimasu> hm, I dont know how to do helcial stuff on that control easily..
[15:52:16] <jmkasunich> it's not EMC? [15:52:29] <anonimasu> it's a heidenhain..
[15:53:25] <anonimasu> I dont know how that control does helical stuff..
[15:54:55] <anonimasu> it's not bad. [15:59:20] <anonimasu> I tried to do ( contours with z arc..
[15:59:24] <anonimasu> err arc on z and x..
[15:59:56] <anonimasu> but I know helical should work..
[16:00:11] <anonimasu> but I think that you need to use a helical cycle for it. [16:01:34] <anonimasu> yeah it does..
[16:23:42] <K`zan> tomp: Interesting site, bookmarked for future perusal. [16:31:12] <anonimasu> maybe I should go have dinner. [16:31:28] <anonimasu> then cut a fixture plate off this stock then go and machine it. [16:49:42] <stustev> the tnc 155 will do helical. do you use the conversational or iso (g code)? [16:50:52] <stustev> tnc310 is the control? [16:53:08] <anonimasu> ramping should work well too right? [17:06:02] <stustev> with ramping you will generally ramp with every z level - with helical you can open the pocket to the total depth you want to go with the first helical cuts and then do you z levels with the hole in the pocket. [17:38:31] <JymmmEMC> Hey, can emc run on a DEC Alpha? [17:39:06] <JymmmEMC> alex_joni: okey dokey, I'll just gut it then. [17:39:18] <alex_joni> it's not i386 right? [17:40:00] <K`zan> Didn't there used to be Linux for that? IIRC it had "PC compatible ports" ?!? [17:41:38] <K`zan> Nah, I got over it :). No space in this postage stamp apartment :-/. [17:43:56] <JymmmEMC> 12MHz with Turbo enabled. [17:44:44] <JymmmEMC> I guess I should take photos of the DEC Alpha before I gut it out. [17:45:32] <JymmmEMC> I believe it is wide enough to have a mobo on one half and cnc controls on the other in the same enclosure. [17:47:19] <JymmmEMC> I just need to find some nice casters for it - then it be easy enough to move/roll around as needed. [17:47:31] <JymmmEMC> and still fit under the desk out of the way. 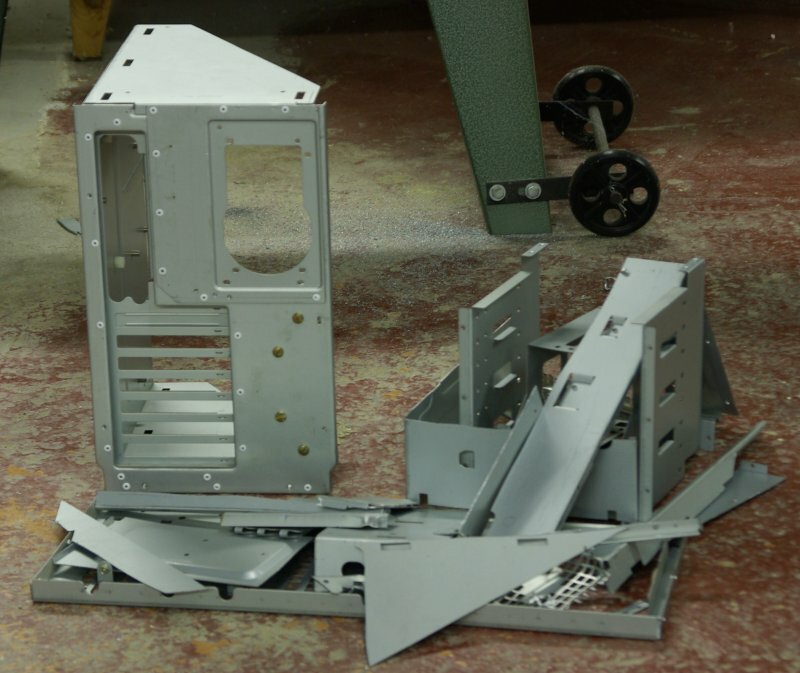 [17:50:28] <JymmmEMC> What is cool about this chassis is that it's screwed, not riveted/welded together. So hopefully it'll make it much easier to modify. [18:01:01] <Sweeper> how long did it take? [18:10:53] <JymmmEMC> jmkasunich: I have a couple 300W 1U PS's - will be louder, but should make for a cleaner mod. [18:12:38] <JymmmEMC> jmkasunich: what's the timer relay for? [18:14:16] <JymmmEMC> jmkasunich: what mobo did you use? [18:55:28] <mrbits> where can i get the hardy/emc2 livecd? [18:58:02] <alex_joni> mrbits: hardy/emc2 livecd? [19:00:08] <alex_joni> where did you see a reference for 8.04 + emc2? [19:03:48] <alex_joni> what doesn't work with 6.06? [19:06:00] <jepler> is your PC unusual? [19:09:02] <jepler> if there's a hardware incompatability we don't know about, that makes it unlikely that it'll be fixed just by using a newer version of ubuntu. [19:10:40] <mrbits> how can i troubleshoot 6.06 locking? [19:11:30] <jepler> then either photograph or transcribe the messages that you see displayed. Often they will help a developer understand what is going on. [19:11:42] <mrbits> ok i will try that. ta! [19:20:39] <mrbits> me go now and try 6.06 again. [19:26:19] <alex_joni> do you do oversee shippings? [19:26:35] <JymmmEMC> alex_joni: Yes, prepaid. [20:04:19] <SkullWorks_PGAB> Pico ITX form factor - thats just insane. [20:18:08] <SkullWorks_PGAB> I may just mount all the electrics on a 1/4" (6mm) Lexan sheet with drawer slides and mount it in the top of the base stand. [20:55:34] <Vq^> can emc run on a smp system? [21:02:44] <alex_joni> so you're interested in HT processors? [21:34:34] <awallin> anonimasu: thx, it seems to work OK now, all three axes. PID tuning with single moves gives max 0,02mm to 0,01mm following errors. [21:35:00] <anonimasu> how does the drives work? [21:36:56] <anonimasu> I should probably buy the analog drives from him..
[21:37:27] <awallin> oh, do you have harware for EMC to read the tachs? [21:39:02] <awallin> is this for your lathe? [21:39:57] <awallin> you have an opti bf-20 also? [21:44:15] <awallin> oh, that must be another model, not the PWM-drive I have? [21:46:44] <anonimasu> dosent mesa have some adc boards? [21:47:15] <skunkworks> it has a servo daughtor board. [21:51:02] <awallin> the analog drives are only $60 ?? [21:53:27] <JymmmEMC> alex_joni: Yeah, I figure I have enough room in there to have everything in a single enclosure, yet still have the ability to swap out mobo etc if I ever need to. [21:54:12] <anonimasu> awallin: just air as cooling? [21:55:01] <JymmmEMC> alex_joni: If I remove the frame that held the removable hdd's in, I'll have a bunch of spare room even. And, the "H" frame dolley with casters on it should bolt on easily enough. [21:56:41] <anonimasu> but 1mm per tooth..
[21:58:26] <SkinnYPupp> Overall material removal rate probably hasn't gone up any. [22:05:44] <dmess> ive cut aluminum at under 3000 rpm.. and won most of my life. [22:06:10] <anonimasu> got any good tips? [22:07:20] <awallin> what kind of tool diameters? [22:12:18] <anonimasu> it's not aircraft alu afaik..
[22:14:40] <alex_joni> "6061 is widely used for construction of aircraft structures, such as wings and fuselages, more commonly in homebuilt aircraft than commercial or military aircraft. " [22:14:42] <anonimasu> I guess I need to cut it with 2 flute tools instead of 4 really..
[22:15:34] <anonimasu> and it's kind of random how well plunging/ramping does work..
[22:16:17] <dmess> do you slow your feed for the ramp/plung?? [22:21:25] <anonimasu> it'll work itself out I guess. [22:22:02] <dmess> what it is you need cut 1st time right??? [22:25:21] <anonimasu> I think I've got the wrong tooling for aluminium. [22:25:37] <anonimasu> im going to try with a 2 flute tomorrow. [22:27:35] <dmess> for alu or a general purpose coolant?? [22:30:17] <anonimasu> it's "omega - coolway"
[22:30:44] <JymmmEMC> This is strange.... I have a transformer that only has two wires on it. [22:32:23] <jmkasunich> is this in the DEC? [22:45:32] <dmess> whats a replacement keyboard for an acer laptop run any one have a clue... ?? [22:50:18] <dmess> can all of you use chopsticks???? [23:26:59] <BigJohnT> did you know a guy named Charles Bumpass at Toshiba? [23:30:58] <dmess> the name sound familiar ... but i cant place a face... out of chicago? ?